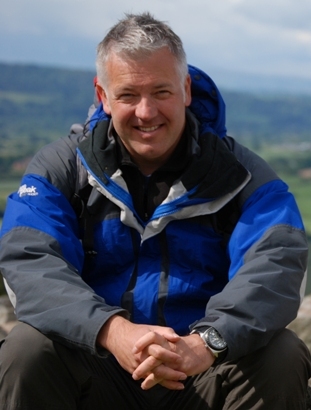 Wandering TV weatherman Derek Brockway is urging people to walk on the wildside. Cheerful Derek, well-known for brightening up the gloomiest forecasts, is backing a series of walking festivals which will celebrate some of the most spectacular scenery in North Wales. The fifth series of Derek’s popular television series, Weatherman Walking, on BBC One Wales took him all over the country. He is keen to promote the wonders of walking in Wales and he has lent his support to four walking festivals which aim to open up the majestic North Wales landscape to even more ramblers. They are being staged by groups of mainly volunteer enthusiasts from Prestatyn, Conwy, Anglesey and Snowdonia who have joined forces to shout about the natural walking terrain of the North Wales countryside. The first in the series of festivals will be the Prestatyn and Clwydian Range Walking Festival from May 18-20. This will be closely followed by the Anglesey Walking Festival from the 2-17 June and the Conwy Walking Festival from 4-11 July. The final one in the series is the Snowdonia Walking Festival from 19-21 October. For the first time, the festivals have come together to promote their events thanks to financial support from Visit Wales, and advice and guidance from Tourism Partnership North Wales (TPNW). Walking in Wales will also be brought into sharp focus this year by the official opening of the Wales Coast Path at Flint Castle on May 5. Following extensive work by the Welsh Government’s Coastal Access Improvement Programme (CAIP), 870 miles of paths around the whole of Wales have been linked up and improved. Three of the festivals will have walks using the newly connected path.